Grinding stumps & stubborn roots of any size. simple. Our machinery is designed for this purpose and they do it perfectly.We use two types of grinders depending on the location and size of your stump. If you’ve got a big or small problem stump, in a corner on a hill or out in the open, we’re equipped to handle it. This is our SP 5014 in slow mo action … it’s vicious, it’s powerful and it’s capable of removing even the most stubborn stump. The retractable tracks give us the ability to access narrow areas down to 1m wide. Stumps are reduced to dust down to 250mm below ground level and the remaining ground can be filled and replanted, paved or concreted as soon as we’re done. Our smaller machine is the SHP400 with power to grind those smaller stumps and roots and the agility to fit in some of the tightest spots you might have around the place. 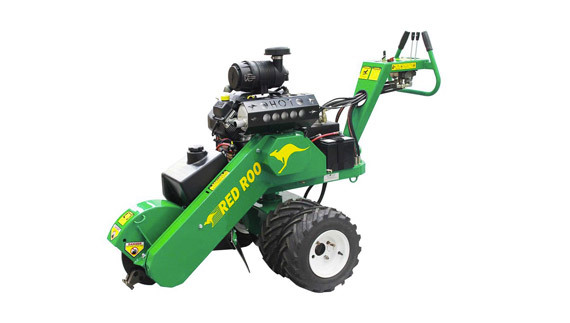 It’s no slouch when out and about, so if you’ve got a tight spot or a smaller stump, this is the machine we’ll use for you. Again, we’ll grind your stump to 250mm below ground leaving the area ready to use again immediately.